Craziest combat match point ever? The 2018 Fight Night Combat season ended with Jochen Pfeiffer winning the European Masters 2018 and Luke Burrage at number one in the year-end rankings. No surprises there... so on to the new year! 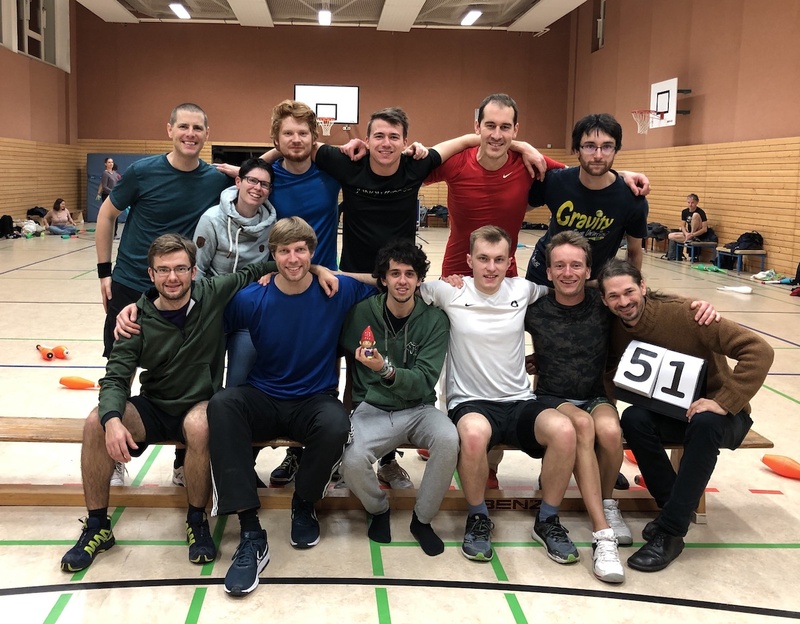 2019 kicked off with three tournaments in the first week, in Germany, the Netherlands and Canada. In Montreal, TurboFest hosted a Fight Night for the third year in a row. This is the biggest tournament in North America, with 28 players this year, and is a National 500 level event. For the third year in a row, Rafi Benjamin qualified as the top seed. For the second year in a row he won the entire tournament. And as he didn't take part in the knockout in 2017 due to injury, he remains 100% undefeated in Canada. He beat Brian Koenig 7-4 in the final to earn himself 500 ranking points and takes himself to number 1 in the 2019 Race Rankings. 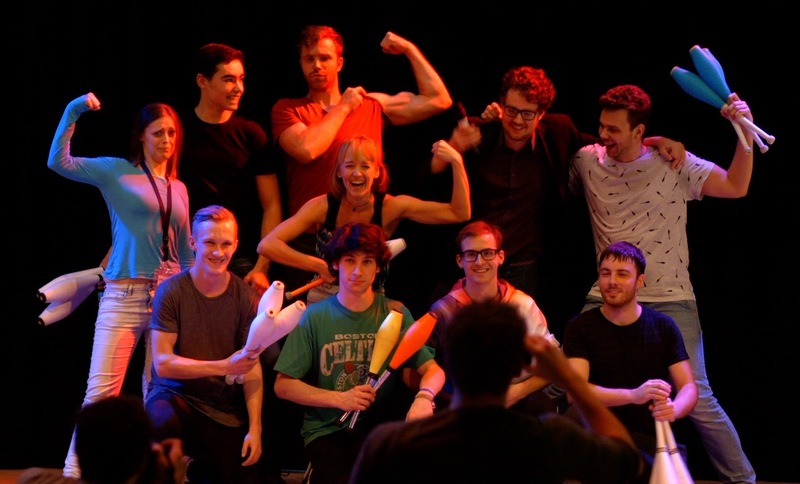 The Dutch Juggling Championships hosted a Fight Night for the fourth time. 20 players took part, with the top 8 making the knockout. The first round matches were all very one-sided, but the action really got going in the semi-finals. In the end, Bas Van de Kerkhof won the tournament, and earned himself 300 ranking points. This is enough for him to break into the top 10 of the 52 Week Current Rankings for the first time, and after winning the HJW 2018 Fight Night, extends his winning streak to 7 matches. Will Bas keep up his good run of form and make it to the European Masters 2019? In Germany, Andreas Braun kept up his good run of form by winning the Passout 2019 Fight Night. He beat Rob Woolley 5-1 in the final. Andreas has not had a Fight Night result worse than third place going back six tournaments to 2017. The 250 points he earned for winning Passout bumps him up to 4th place in the 52 Week Current Rankings, his highest ever position. After a final round of National level tournaments in October, the field is set for the European Masters 2018. 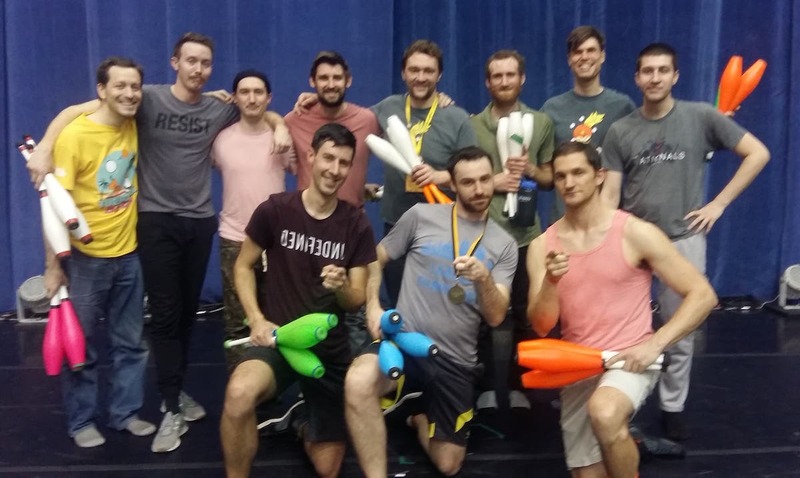 The top 10 jugglers of the year, based on points accumulated only at tournaments in the 2018 season, have all been invited to Berlin to take part in the ultimate showdown of combat juggling prowess. Below is an introduction to all the players, along with how well they have played this year against the rest of the participants taking part in the tournament. The number one player of the year is Luke Burrage, with two Major wins (NJF and EJC). He's the only player to win four tournaments so far in the 2018 season, and with 22 match wins total is the most successful overall. He has a 5 win to 4 loss head-to-head against other European Masters participants in 2018. Brook Roberts is the second seed, with runner-up finishes at two of the biggest tournaments of the year, including his first ever EJC final. He won two 250 tournaments (Cambridge and Bath) and has a 5-3 head-to-head against the rest of the field. Jon Peat missed the European Masters in 2017, even though he qualified, but was the first to qualify for the European Masters this year by winning the BJC Fight Night. He won a total of 17 matches in 2018, the second highest of any player, and has a 1-4 record against the field. 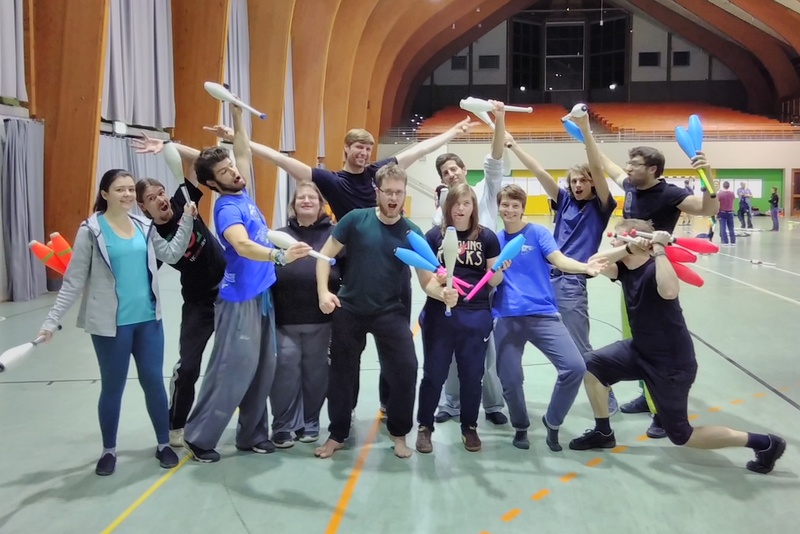 Alexander Müller won two Nation Level tournaments in 2018, at the Israeli and French juggling conventions. He backed those up with a second place in Hamburg and a fourth place in Berlin, two more National Level tournaments. He has a 2-4 record against the field, though those account for all of his four losses in 2018. Vašek Peca won tournaments in Brianza, Brno and Hungary, and added to his points haul with solid results in Berlin and at the EJC. From the Czech Republic, he's the only non-German-non-British juggler to make it into the top 10 this year, and he has a 0-2 record against other players at the European Masters. Jochen Pfeiffer has extended his 2017 winning streak through the entire 2018 season, and has once again gone unbeaten for the year. He is only so far down the Race Rankings due to not defending his title at the EJC. He won in Berlin (750 points) and Hamburg (500 points) and topped up his total at the Berlin Lacht mini-tournament (125 points). He has 6-0 head-to-head record against the field. Julius Preu managed to reach October without losing a match in 2018, with tournament wins at the Tropical Islands Invasion, Cumbria and Karlsruhe. He came up short in Hamburg, losing to Alexander Müller and settling for third place. He's 7th in the Race Rankings and has a 5-1 record against the field. Andreas Braun has qualified for the tournament twice before but couldn't make it to Berlin. This time he's making his first European Masters appearance, qualifying in joint 9th place. He won his home tournament in Aachen and scored third place finishes at the EJC and Berlin. He has 1125 rankings points, and has a 2-2 head-to-head record against the field. Markus Utke also has exactly 1125 points, and is tied in 9th place with Andreas. He made the final at two Major 750 tournaments, losing to Luke Burrage at the NJF and Jochen Pfeiffer in Berlin. He got to the quarter-finals at the EJC before withdrawing due to injury, so only has two those two losses this year; a 1-2 head-to-head against the field. Finally, in 10th place, is Junis El-Sarout. This year only the top nine received an automatic invitation to Berlin, with the 10th spot reserved for a wildcard. But with an incredible five second place finishes from eight tournaments in 2018, he more than earned his invitation to take part in Berlin. He has a 0-5 head-to-head record against the field. Keep an eye out for more news before the event, including how to watch in person or watch via the live stream. The Race to Berlin is entering the home stretch! The European Masters, the end-of-year final tournament of the Fight Night Combat 2018 season, will be held on the 24th of November. The 2018 Race Rankings determines the invitation list, and the top players have until Monday 5th November to accumulate as many points at as many tournaments as possible. Those who earn an invite are rewarded with an all-expenses-paid trip to Berlin to take part in the	ultimate showdown against the best of the best! Already qualified by winning one of the four Major tournaments are Luke Burrage (NJF and EJC), Jon Peat (BJC), and Jochen Pfeiffer (Berlin). Brook Roberts has also qualified by holding enough rankings points (1967) that not enough players can overtake him in the race. Currently 4th in the Race Rankings is Vašek Peca, winner of the Brianza and Hungarian Fight Nights. He's followed closely by Alexander Müller, winner of two National 500 Fight Nights in Israel and France. Alex has more than a 200 point lead over Cameron Ford, who is currently 6th in the Race. The last two spots in the provisional invite list are Markus Utke and Andreas Braun, both with exactly 1125 points. Markus came second in two Major tournaments (NJF and Berlin) and retired injured from the EJC after his round of 16 match. Andreas came third in Berlin and the EJC, and won his home tournament in Aachen. Close on the heels of Markus and Andreas are Michal Keda, Callum Lawrie and Sebastian Martini. Further down the rankings, keep an eye out for Julius Preu, who has gone unbeaten in two tournaments this year, and can easily make up places with one or two more strong results, and also Stephan Cipra in 13th place, who has entered the most tournaments of any player this year in his effort to qualify (11 tournaments). This year the 10th invite will not necessarily be the 10th highest player in the Race Rankings, but is reserved to reward unique contributions to the Fight Night Combat scene and to increase diversity at the event. Who is going to qualify? Keep an eye on the results from the last dozen tournaments in the 2018 season to see how the race hots up. The biggest points hauls will be available from tournaments at Cambridge, J-Fest, HJW, Hamburg, and (coming up this weekend) Karlsruhe.